Romerium is the project of Rene Montfoort, a Dutch musician who goes around in the circles of EM since 2002 when he formed White along with Michel Bekkering. After 5 albums, which caressed the diverse poles of modern EM such as Ambient, Berlin School and even New Age, the duet added 2 other musicians in 2005 to form ModularWhite. And still there, the band interpreted an EM which gathered nectar between the ambient and Berlin School styles as well as replace the New Age approach by a sort of electro-pop. And since 2009, Rene Montfoort is all alone in his new musical venture with the name of Romerium. His experience here is undeniable, him who is already at his 15th album since 2002, and can be feel in a beautiful control of his ambiences on minimalist rhythms where the impression to hear Steve Roach, Neuronium and even Indra is not completely false. 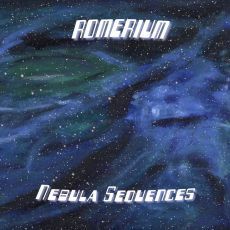 “Nebula Sequences” is the 6th album of Romerium, and I have to admit that I was pleasantly charmed by these old aromas of the vintage years that Rene Montfoort has restored admirably in tones with his virtual range of instruments. "Nebula Sequences 1" invites us in this very beautiful discovery with an introduction loaded of hollow winds and sound effects borrowed from an organic fauna of another world. The impression to hear a light fluty breeze remains as likely as a mirage. A movement of sequences loosens its keys which parade with a light effect of jerk, braiding a delicate stroboscopic movement which derives like a snake sleeping on the webs of cosmos. Minimalist, the structure of rhythm derives between beautiful layers of a synth filled of ether and behind a melody which hums with gleaming arpeggios. We have the feeling to be on familiar ground, but without being able of pointing the finger at which. This impression of having already heard without being capable of specifying neither who nor what is all at the honor of Romerium who possesses thus his own style. I dreamed of having heard Adelbert Von Deyen lost in mists full of astral voices of Software. The influence which has guided the evolutionary structure of "Nebula Sequences 2" is very clear! Steve Roach is his deep immersive atmospheres of the series Immersion and the furious rhythm of the Stormwarning period which quietly diverts towards Schulze and his samplings era. That remains very good, even with these strong fragrances of influences. "Nebula Sequences 3" takes out its roots from the Roumanian School with a lively structure decorated with sequences which sparkle and jump in all senses on a fiery ballet of fireflies starving for light. The arrangements are very well made with flavors of East and with Arabian synth layers which float and wave on a structure always so rebel, even with some short phases a little bit quieter at the level of the moods but not in the rhythm which has constantly the jitters. Hummings, mooing, metallic breezes and layers of voices furnish the opening of "Nebula Sequences 4", by far the most fascinating title of “Nebula Sequences”. The sequencing pattern is hopping with keyboard riffs perfumed of sibylline charms. A double gets loose from the movement, creating a rhythmic figure which jumps alternately under the tears of synth filled of those always esoteric flavors. Like a long skeleton of snake which hiccups and grabs back its bones, the charmingly chaotic rhythm takes root in its minimalist membrane whereas that good synth solos wind and overfly this strange limping pattern of which the effect of hypnosis is fainting in one finale as much intensely noisy than the introduction. In addition to the first two excellent chapters of Vanishing Point, the boys of Airsculpture put at the disposition of their fans a 3rd chapter offered in downloadable format only and to a price more than reasonable. Except for "Diastole", which is a title of heavy atmospheres where howls, groans or daydreams a storm of dark winds and of sibylline melodies, “Vanishing Point Volume 3” proposes 2 titles which come from Vanishing Point Vol. I, but in different musical visions. By itself, the complete version Ranger Station is worth the expenses! An entire introduction which adds up around 8 minutes for a delicious extension of a structure of rhythm comfortably installed in its minimalist cocoon of more than 25 minutes "Ranger Station (complete)" is a real delight for the fans of the English trio which has a huge enjoyment here by sprinkling here and there some little treasures of tones and electronic effects which explain the ever great fame of the synthesizers and why we are so fond of them. The same goes for a structure of rhythm which cavorts and resounds cheerfully in an intense, needs to say it, sound mosaic which brushes slightly the borders of the night psychedelia. "Diastole" plunges us into an intense medley of hooting, mooing, winds or dark breezes. It is as a long journey through a labyrinth of sepulchers where the anger of the inhabitants is translated by an armada of beatings and knockings, a little as spectres which want to scare off the intruders. The sound envelope is rich and the atmospheres are a little bit disturbing. And Airsculpture continues to regale us with "You’ve got Necrophonic Mail" extirpates its chaos from this very atypical rhythmic portion which has made of Necrophone the cornerstone of Vanishing Point Vol. I. Except that here, there are no shadows nor of nuances in these tom-toms which drum a kind of trance tribal Amerindian. Established on tones of another world which were found on John Christian's answerphone, the trio wants to recreate the atmospheres of an aimless walk in a deserted and decaying cemetery. I would say that it’s more the case with "Diastole", but we are not completely far from that here, especially when the finale gets closer. This rhythmic minimalist thrones on 20 of the 26 minutes with a meshing of sequences a la Schulze, contemporary era, deaf knockings and percussions which bang and go off the rails in an ambience weaved by effects and arrangements which could feed a latent paranoia, but especially with these lines of synths loaded of spectral harmonies that we have to seek for so much the effects of atmospheres and percussions feed the extravagance of a title that the fans of Airsculpture would not want to miss. Is “Vanishing Point Volume 3” a necessity? That depends on which side that we are. For the fans of an EM structured, not really! But for the aficionados of these long improvised sound Masses which always eventually end in a process of nirvana and to explode, maybe. Although "You've got Necrophonic Mail" is a monument in itself! But for the fans of Airsculpture? The question doesn’t even arise! The music of Airsculpture is the perfect example of a music which it's necessary to listen to carefully and not just to hear like that. Otherwise, we miss all sort of details. As the opening of "Infinity Halt" and this delicate pulsatory movement which escapes from the magnetism of an astral choir. If the notes of a piano, rather nostalgic, accompany these seraphic chants, the quietness of the movement wraps us with a pair of sedative wings. You should not fight against these moments because a series of light beatings welds our senses in expectation. Especially that a fluty breeze embraces a tranquil rhythmic which gets lost in fields of ether a little before the point of15 minutes. "Infinity Halt" falls then in an intense ambiosonic phase where the winds mutter and moo in a kind of magnetic storm with arrangements which will remind to some of us these claustrophobic atmospheres in the enormous The Fall of the House of Usher from The Alan Parsons Project. During almost fifteen minutes, this phase of atmospheres for tortured minds goes towards a good structure of ascending loops of rhythm of which the echoes and the adjacent sequences forge a continuous minimalist structure which skips with its imperfect and jerky jumps in some silky coat of ether. Synth colored larva deliver beautiful seraphic harmonies which sound like these distant perfumes of Tangerine Dream, era Baumann, while the rhythm increases speed and strength towards a delicious final of hypnosis with technoïd pulsations and effects of percussions which reminds to us why it’s imperative to listen carefully and not just hear the charms of Airsculpture. After several months of deadlines, here is the promised follow up to Vanishing Point Vol. I! 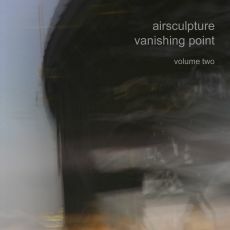 “Vanishing Point Volume 2” follows a little the premises of its younger brother of sounds with another collection of titles performed only in the USA within the framework of The Gathering Concerts in November 2011. And contrary to the first volume, “Vanishing Point Volume 2” exploits 2 very long titles which always show how Adrian Beasley, John Christian and Pete Ruczynski are always on the same page, year after year. One warms the equipment and one put the public, very enthusiasm by the way, in the moods with long intros filled of electronic tones which are the privilege of the long improvised titles. But the engines are already warmed for "Vanishing Point", without a doubt the most homogenous track of the England trio, which get uproots out of these tones as well as from a push of hollow winds and of glaucous pulsations to make it sequenced chords limp, sounding a bit like these uncertain figures of rhythm of Klaus Schulze in his contemporary era. Tears of synth whine with elegant ethereal veils while the structure staggers constantly under the salutes of the silky synth layers. Knockings get in, always emphasising the gap between a structure of ambient rhythm and another one more pugnacious. It’s in this way that takes place the 40 other minutes of "Vanishing Point" which always wraps us of a big synth comfort while the rhythm accentuates slowly and constantly a swiftness coated of a certain heaviness. The synth layers are like these mirages of a waltz of clouds while the trio carries constantly other sequences which sparkle, skip and limp in a huge magnetizing rhythmic tapestry. The structure becomes more vintage near the 23rd minute with a superb movement of sequences which shifts marvellously the measure between each step, bringing "Vanishing Point" towards one finale as much infectious as "Infinity Halt". Amazing! "The Main and Great Proposition" banishes the principle of long introductions weaved in the ambiguous moods and the interstices of EM equipment. The rhythm takes off as soon as a hopping sequence is capable of getting rid of its solitaire jump in order to spread a lineage of sequences and resonant pulsations which structure the very atypical rhythm of "The Main and Great Proposition". The title dives into the heaviness of a good electronic rock haloed with great effects and with superb synth solos which always crown this rhythmic weaved in the disorder. This is some great Airsculpture and a superb album which will please all those who had their blast in the 70’s with an inspired music which brought us where we still did not know the boundaries. Definitely, Poland has become the land of asylum of the Berlin School style. I shall go even farther; the Polish artists realized what those of France achieved in the middle of the 70's, that is to annex the roots of the Berlin movement in a cosmic vision and especially poetic which made it warmer. So was born the French Cosmic School and so was born the Poland School with the coming of the very serious label Generator PL. Piotr Cieślik is the last find of the Polish label which seduced the sphere of EM recently with the very beautiful Anunnaki from Piotr Gepert and quite recently the fantastic Let Them Float from Przemyslaw Rudz. If I make a reference to these 2 albums it's because “Journey into the Unknown” which is the very first album of Piotr Cieślik, drinks of these 2 wonderful albums while bringing a delicate sonic French-style prose. The waves of a distant intergalactic shore get lost in silky layers perfumed of ether which derive in the cosmos. Some rather discreet arpeggios skip in the background, shaking the first vestiges of rhythms and of "Ocean's Loneliness", and of “Journey into the Unknown” while the synth is stammering some of its nostalgic dreams. And bang! There is not 3 minutes at the meter that Piotr Cieślik shows us of what he is capable. The rhythm is as much fluid as heavy with a continue movement of the sequencer which frees another line in parallel where the keys skip as the snips of scissors of a barber mythomaniac. And always these soft laments of a synth which plunges the atmospheres of "Ocean's Loneliness" into a kind of Jazz Lounge which the harmonies of a delicate piano do not deny. 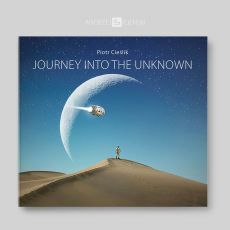 In a structure in perpetual movement, Piotr Cieślik enjoys to confuse our expectations by mixing the aromas of a good cosmic electronic rock with more musical phases that our ears recognize without identifying clearly. And that's the way it is all throughout “Journey into the Unknown”. After a short ambiosonic introduction, the title-track spits a heavy and slow rhythm which skips in a linear movement where dance other sequences and whistle diverse cosmic elements. A fluty synth hums discreetly whereas the rhythm crashes into a beautiful melodious phase in middle-route. This is the moment chosen by Piotr Cieślik to loosens his graceful fingers on a piano which hums a melody as pleasant as jazzy on a rhythmic always so heavy but which fades in the background in front of this very stylized melodic decoration. The arrangements are very good and we cannot refrain from making a link with Vangelis in the rather melancholic approach of melodies, as strummed as laid down by a synth. "Power Crystal" exchanges its rhythmic structure, a mixture of Berlin School and ['ramp], for two atmospheric phases fed by a thick cloud of hollow winds. 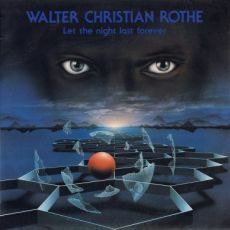 "Call of the Ancestors" is rather theatrical, kind of Let the Night Last Forever from Walter Christian Rothe, with a rhythmic approach which oscillates in a sneaky way. These last two titles plunge the listener into a mixture of rhythms and ambiences where the harmonious signature is not that much present and is assumed by the movement of sequences. But it's the very opposite with "Comet's Fate" which is a superb electronic rock. The sequences get in the dance while the synth blows cosmic harmonies worthy of the best moments of Jean Michel Jarre. This is a great track which dips us back into these atmospheres of very French dramatic sound theater with "Soul Roaming", the finale is going to amaze more than one, before that "Reminiscence of the Journey" nails us on the spot with another great cosmic rock which hides a melody eater of ears and which gives us no other choice that to listen again to “Journey into the Unknown”; a splendid album where the sound aestheticism, the production and the just balance between the rhythms, the melodies and ambiences make of it my firm favorite and my discovery of 2016. A must because Piotr Cieślik shows that EM is more than a story of knobs, of threads and of preprogrammed recordings. A line of lively and hopping sequences scatters the mist from the snores of machine and the long shaded wings of a synth to highlight the very lively rhythm of "Space Fields". The percussions structure a good electronic rock dipped into synth layers of which the fluty breezes will remind to some of us the rhythmic structures of the Jive era of Tangerine Dream. Frank Dorittke adds a 2nd more harmonious line which hiccup in a jerky structure and introduces a very beautiful harmony whistled by a synth fill of Mike Oldfield's perfumes. On heavy and lively rhythms, forged in patterns of sequences which swirl and/or zigzag in very energetic minimalist structures, and packed with harmonies chiselled from his unique guitar and from his synths, F.D. 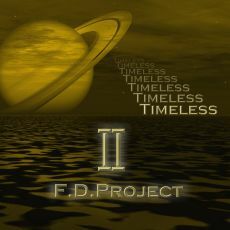 Project presents in “Timeless II” his most solid album to date. If we swirled with the hypnotic spiral of "Space Fields", "Lost Ship" brings us towards a motorik heavy structure with a mixture of knockings and deaf pulsations which hammer a jerky rhythm that percussions redirect into a more fluid structure. Cosmic effects, ethereal layers and vampiric shadows surround the harshness of the rhythm while some very good and incisive guitar solos flagellums and pierces it after the point of 3 minutes. And this until its finale. "Elemental Movement" proposes another minimalist and loud circular structure fed by diverse tones among which jingles of cymbals and chords parading here and there in the shape of stroboscopic thin lines. The synth here is wonderful and frees some very good dreamy harmonies. This is another solid track, lively and catchy with just enough nuances so that we appreciate these long minimalist ritornellos. Do we inevitably have to speak about "The Return of O; Part V"? Absolutely! On a structure always built in the loudness, in the heaviness, Frank Dorittke brings us in the territories of Q2 with a delicious spheroidal approach as ethereal as Celtic. Reminiscences of Tubular Bells are always there, as well as some fragrances of 5 Miles Out, and the plentiful solos of a guitar are always so conquering. "Spectralis" will become the most beautiful ballad of F.D. Project's repertoire. Imagine Drunken Mozart in the Desert, by Edgar Froese, but in a speeded-up movement. It’s a little the backbone of "Spectralis" which unwinds a bed of sequences sparkling like a mass of hummingbirds equipped of diamond wings. Hallucinating, this structure is supported by sober percussions which give to it a so rock approach as the sequenced melody can be in mode ballad. It’s lively, contagious and the melody drills its earworm while the guitar, always so incisive, makes its very inspired solos swirl again and again. After an introduction weaved in the musing, "Timeless Two" extricates itself from its ethereal phase to offer a heavy and slow rhythm which gains in intensity. The guitar is always carrier of solos which disembowel the indifference. "An Evening (Live)" is a title performed at Ledigenheim Dinslaken, Germany, in May 2014. Moreover, a video of 30 minutes is available on You Tube. It’s a great incursion into Jean Michel Jarre's cosmic universes and those movements of lively sequences which have revolutionized the art of the electronic rhythms with Stratosfear from Tangerine Dream. There are lots of winks of eye to the music of Oxygene here and Frank Dorittke shows that he feels very at ease as much with his synths and his sequencer as with his guitar which opened him the doors of this delicious fusion between the Celtic approach of Mike Oldfield and the EM very Berlin School and/or cosmic. A superb album and an excellent surprise, “Timeless II” has found its place on my top 10 list of 2016!